30% OFF OUR RECORDED WEBINARS THROUGH SUNDAY! we know you LOVE the continuing education webinars we produce. In turn, we love and appreciate your support. So here's a sweet deal for the dietitians we care about so much. We’re offering 30% off of the recorded webinars in our CE Learning Library through this Sunday, February 18. 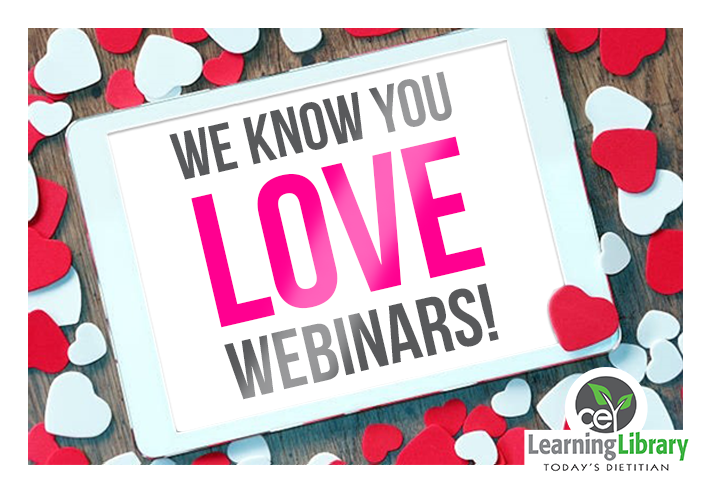 Choose the webinars on the list below that you want to watch and earn credit from, then use the Coupon Code WEBLOVE30 at checkout to get your discount. Private Practice- What Are You Waiting For? Visit CE.TodaysDietitian.com to check out all of our courses, webinars, and more! Happy Valentine’s Day! Offer valid through February 18, 2018, at 11:59 PM EST. Offer Includes only the Recorded Webinars listed above. *Offer cannot be combined with any other promotion.